Hey guys! Sorry that there haven’t been any reviews in so long. Both Moeronpan and I have been super busy—Moeronpan with business, and me because… I was super sick. But I’m a lot better now, so have a really delayed Earth Defense Club review. We’re both still planning to keep the review schedule for this series, so Moeronpan’s review of episode 11 will probably be out sometime next week, and my review for episode 12 will be out sometime after that. Cute, but looks can be deceiving. Yumoto one day falls ill at lunchtime. A classmate of Yumoto’s, named Megawa Rui, confirms this; so the four other Earth Defense club members take Yumoto home to his older brother. The next day, Yumoto unexpectedly shows up at school wearing glasses, because he claims that his eyesight got weird. But that’s not the only thing weird about him, as the other club members quickly realize that Yumoto is acting way too formal and much more pleasant than usual. 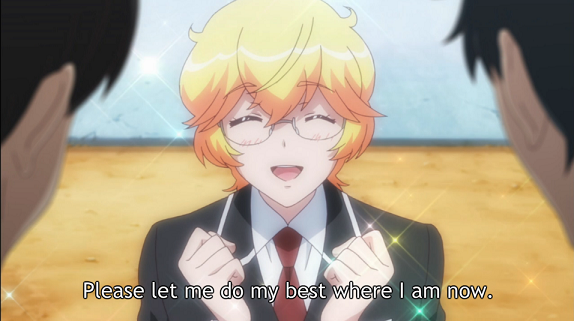 Why can’t Yumoto’s older brother have more screentime. Because Yumoto is so pleasant now, many sports clubs want Yumoto to be their manager. Upon seeing this, Megawa is jealous. Megawa had spent so much time being cute and doted upon that he can’t bear to see someone else usurp his social position. He’s quickly turned into a monster-of-the-week by the student council members. 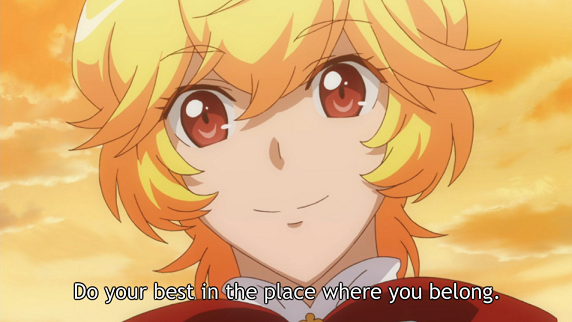 I don’t think choosing sports club managers work that way but sure anime. 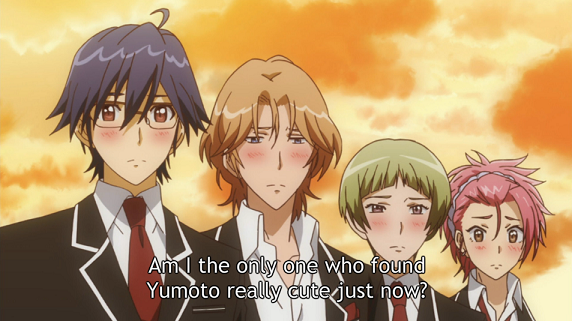 Everyone is gay for Yumoto: confirmed. Before the school day ends, monter!Megawa appears in front of the Earth Defense club members and fights them. Unfortunately, Yumoto can’t seem to transform because he’s too scared. This week’s monster is the strongest they’ve ever fought, and the guys are nearly defeated. Luckily, Wombat manages to accidentally knock Yumoto’s glasses off, causing him to return to his normal self. He quickly transforms, and they all defeat the monster together. Meanwhile, the news club is revealed to be working under a talking alien animal just like the Earth Defense club and student council members. Glad to have you back, Yumoto. Meh. This episode was okay. Even though I do like cute glasses characters, this episode just felt kind of dull and a bit half-assed to me. The only real source of comedy here was from these two gags: “look at that, that cute character is actually super evil!” and “Yumoto’s acting so out of character isn’t it funny? !” Those types of gags are pretty old hat, but they can still be fun of done properly. As you can probably guess by my reaction to this episode, I just felt that those gags were played in the safest way possible, making them boring. It’s a downside for having a monster-of-the-week character based on victims-of-the-week, but Megawa’s whole shtick would have come off as funnier (or more of a twist) if he hadn’t just been introduced in this episode. Because of that, his monster transformation could be seen from a mile away—and indeed I already figured out what would trigger his transformation right after his introduction at the beginning of the episode. As for Yumoto’s OOC-ness, I’ve seen it done better. I think what happened is that they didn’t make Yumoto’s personality “opposite” enough. Usually what makes these “switched personality” episodes work is that the character in question acts like essentially a polar opposite of their usual personality. So a mean character becomes super nice, and a nice character becomes super mean etc. But Yumoto just acts… more like a normal person and more subdued? The reason it fails is because Yumoto’s a hyperactive kid but he’s still pretty kind and pleasant (imo). So the whole gag just feels half-assed, but then the problem is that the episode wouldn’t work if he DIDN’T act this way, due to plot reasons. So maybe the writers just painted themselves into a corner with this episode’s monster. And it’s never really explained just WHY Yumoto’s personality gets changed so drastically, apart from “maybe it was magic glasses.” Yes. Seriously. I understand that this series isn’t meant to be taken seriously but that’s the most asspull explanation I have ever heard. Like, at least if it was his fever that would have been more believable than just… whatever the heck happened in this episode. Overall, yeah. Not too fond of this episode. The plot was just kind of a mess, and the animation wasn’t that good either. There are some important reveals here, such as the Earth Defense club AND student council members finding a secret door in their respective rooms; and also the reveal of the news club’s fish being yet another alien. But other than that, this episode just felt like a waste of time. Aw man, this was actually my favourite episode so far to be honest. I don’t even really know why, it was just a lot of fun to watch and it made me laugh. Hopefully I can do the next review soon, I actually haven’t gotten the chance to watch it. 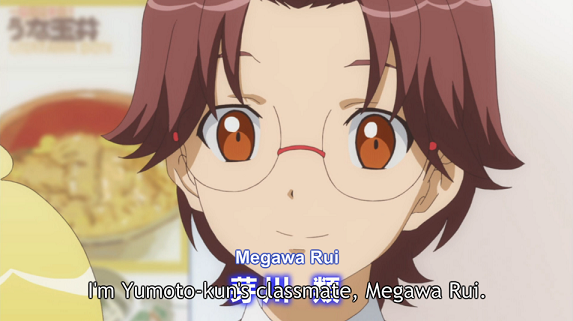 also the megane boy has the lamest pun name so far, Megawa Rui- Me ga Warui, or ‘bad eyesight’, I cannot believe. 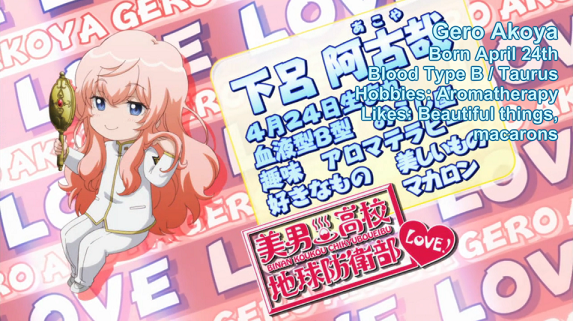 Anime Reviews, Binan Koukou Chikyuu Bouei-bu LOVE!